Wild Face Bulldogs In Double Header Weekend – With Santa Special on Sunday! Wild players and fans celebrate Jakub Hajek’s OT winner against Bradford back in October. 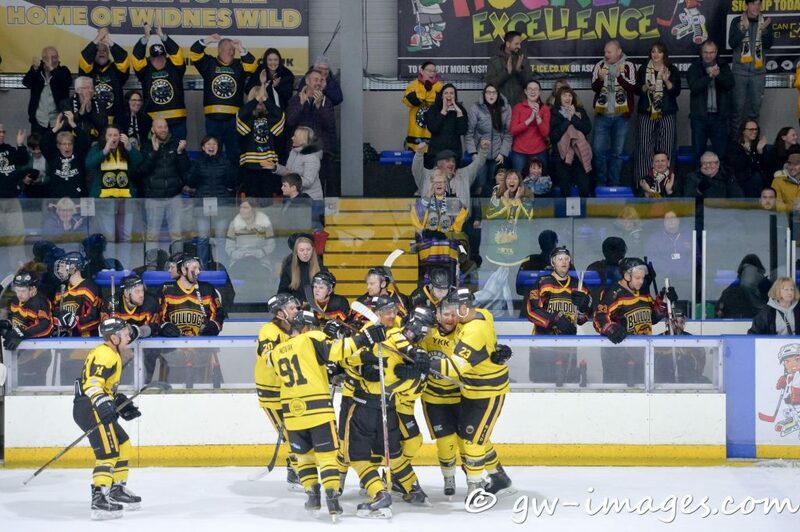 The YKK sponsored Widnes Wild have an incredibly tough weekend coming up as they have back to back games with Bradford Bulldogs – away in West Yorkshire on Saturday and then at home at Planet Ice Widnes on Sunday. The Bulldogs have a very strong squad this season and currently sit in 4th place in the Laidler Division table, having led the league for the early part of the season. Bradford ice rink is always a difficult place to go and play and, although the Wild have beaten the Bulldogs in their two meetings so far this season, both games were very close and could easily have gone either way. Bradford are in a good run of form at present, having won their last three games in a row – including winning away in Altrincham and then beating the league’s second place team Sheffield Senators in their most recent game. Widnes have won their last 12 games in a row and will be keen to keep that run going with back to back wins this weekend to give them a commanding lead at the top of the Laidler Division table ahead of the Christmas and New Year break. As Sunday’s home game is the last Wild game before Christmas, there is going to be a festive party atmosphere. Fans are urged to wear Santa hats and jumpers and other festive attire. Santa himself will be there at the game and there will be a competition for the best Christmas dressed family. The YKK sponsored Widnes Wild travel to face Bradford Bulldogs this Saturday 15th December and are then at home to the same opposition on Sunday at Planet Ice Widnes. Face off is at 5.30pm and doors open at 4.45.